Just last week I was building up a head of steam over a topic, trying to write a blog post about it, and then I saw Dara’s post on the same topic, and it helped me focus on the important part to write my own post, and linking to hers. And it’s happened again: what next, New York Times – a story about how the old Nazis feel “cut off” in Germany? The title alone is very close to the one sentence I comment I had on the New York Times article in question when I included it in Friday Links. And she nails it. The New York Times article tries to sell us a sob story about those evangelical Christians who have run afoul of anti-discrimination laws or otherwise been called out for their bigoted behavior. The NYT wants the reader to feel sorry for these people who just want the right to discriminate against gay people, and who wish that it was still illegal for gay people to be openly gay, and so forth. America has changed so quickly, they lament! Why, oh why does no one understand their pain? On Dara’s blog a NALT1 Christian chimed in being all offended at being compared to Nazis. He claimed that he didn’t know any Christians who were pushing an anti-gay agenda, or certainly that there aren’t any now. Maybe decades ago, sure, but not now. 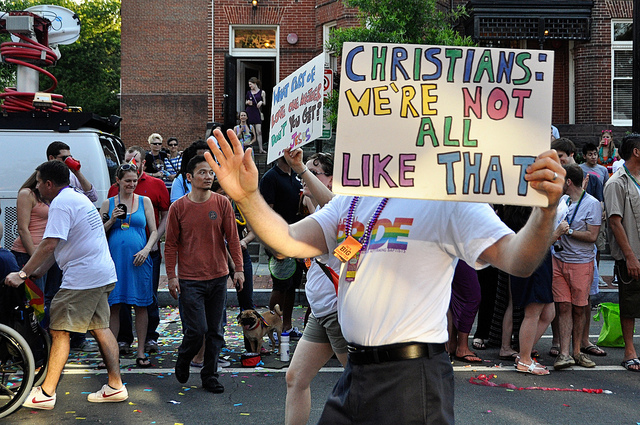 First, the self-identified Christians quoted in the NYT article are actively pushing an anti-gay agenda right now. That’s how they got into the situation they are in. Second, more than one of those folks claiming to be Christian who are quoted in the article, explicitly and implicitly say more than once that people who aren’t anti-gay aren’t Christian. And they are hardly the first to do so. Third, every business that has run afoul of anti-discrimination laws by denying service or otherwise discriminating against queer people have been defended by lawyers from the Liberty Counsel, an explicitly Christian non-profit organization that includes multiple references to their Christian affiliation in every public statement. In fact, every single anti-gay initiative, referendum, or law that has been pushed in the last three decades, has been championed by Christian organizations such as the Liberty Council, the Family Research Council, the National Organization for Marriage, the Catholic League, Abiding Truth Ministries, the American Family Association, Americans for Truth About Homosexuality, the Christian Anti-Defamation Commission, the Concerned Women for America, Coral Ridge Ministries, the Traditional Values Coalition, et cetera, et cetera, et cetera2. And every politician who has defended anti-trans/anti-gay/anti-lesbian laws and policies has made references to their sincerely held Christian beliefs as the reason why they are pushing the anti-queer policies. It is simply not plausible that anyone paying any attention whatsoever to the controversies over marriage equality, trans bathroom bills, anti-bullying campaigns in schools, so-called conversion therapy, and so forth to not have noticed all the scripture quoting, Bible thumping, and God invoking that has been done to justify the anti-queer actions. So, I call BS on the guy trying to claim that he has no knowledge of any reason us queers would feel targeted by Christians. Fourth, every queer person I know over the age of 30 has had at least one bad experience being bullied, harassed, bashed, or otherwise mistreated by someone doing it in the name of Christ. Each and every one of us. That’s a whole lot of coincidences, if you’re going to insist that’s all it is. So, yes, I am well aware that not all Christians are like that, but some are. And it isn’t just a few. It isn’t queer people like me giving Christianity a bad name, it’s self-proclaimed Christians like Mike Huckabee, Scott Lively, Gov. Pat McCrory, Judge Roy Moore, Rev. Franklin Graham, Glenn Beck, Ted Cruz, Rev. Samuel Rodriguez, Joel Osteen, Congressman Rick W. Allen, and so on. And it’s the tens of thousands of self-proclaimed Christian voters who support anti-gay politicians like Roy Moore, Pat McRory, and Rick Allen. It’s the millions of self-proclaimed Christian voters who selected delegates to the Republican National Convention which this year passed literally the most viciously anti-queer political party platform ever in the history of the U.S. If you don’t like being called a bigot3, stop acting like one. And stop scolding people who accurately point out bigoted actions when we see them. And stop defending bigots when they claim that they’re the victims because sometimes they get pushback when they say and do bigoted things. And stop writing whiny articles about the terrible predicament of bigots who aren’t allowed to practice their bigotry with utter impunity any longer. 1. NALT = Not All Like That. People who decide to scold queer people any time we talk about being mistreated, discriminated against, or bashed by other folks claiming to be Christian. Usually they try to imply that we’re giving Christians a bad name, and we shouldn’t do that. They don’t take too kindly to it when we point out that we’re not the one’s ruining Christianity’s reputation, it’s their co-religionists. Nor do they ever seem brave enough to take the advice that if they want the world to stop equating bigotry with Christianity, then they should be scolding the bigoted Christians. 2. If you want to know more about these groups, the Southern Poverty Law Center has nice historical write-ups about these and other hate groups. 3. And stop trying to claim that being called a bigot is the equivalent of passing laws to criminalize our relationships, to allow us to be fired for who we love, et cetera.